If movies about space have taught us anything, it’s that no one can hear you scream. If you get lost in space, nobody’s going to find you. Unless you’re a spacecraft with a direct link to NASA. Then, there is hope for you yet. STEREO-B, from the Solar and Terrestrial Relations Observatory mission, went missing on October 1, 2014 after losing contact with the team back on Earth. However, on Sunday night, scientists were able to reestablish contact, after 22 months of searching, when the Deep Space Network (NASA’s tool for tracking space missions) was able to lock on to the signal. In October 2006, STEREO-B and its partner STEREO-A embarked on a two-year-long mission to provide measurements of the sun’s flow of energy to Earth. One was slightly inside Earth’s orbit, and one was outside, allowing scientists to measure energy from multiple angles and eventually, the far side of the sun for the first time. However, the team ran into a problem. 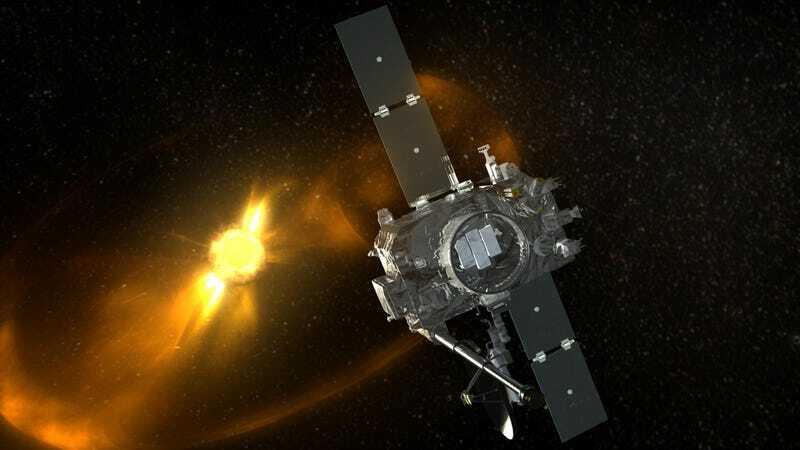 One of the spacecraft was about to drift to the opposite side of the sun from Earth, so there was going to be a three-month period during which communication would be impossible. Since the spacecraft were only designed to be in space for two years, this development was overlooked at the time of the launch. Because the spacecraft was designed to reset after 72 hours without contact, the team decided to test it to make sure it could reestablish a signal with Earth durimg this reset period. The scientists figured it would turn itself back on. The team received a weak signal after the first reset, and that was the last time they heard from STEREO-B. Until this week, when the Deep Space Network established a link with STEREO-B’s signal. In a report from December 2015, scientists hypothesized that the tests went awry because the sensor that tells the spacecraft how fast it’s rotating failed, sending it spinning out of control. Meanwhile, the spacecraft’s battery was powered by solar panels, which weren’t able to get energy to power it up. Since communications were lost, scientists have been using the network to check for STEREO-B, spacing out three three-hour blocks each week to search for it. This was a tough task, considering scientists had no idea where the spacecraft was. But the newly located STEREO-B isn’t out of danger just yet. The STEREO team will plan further recovery processes to ensure that the spacecraft is working properly. The team has already spent several hours testing its vitals before powering it down to save battery. It’s a process that might take years. In 2019, the team will be able to use Hubble to see it and test its rate of spin. So I guess STEREO-B got its happily ever after, at least for now. It’s still sad to think about it floating in space, spinning out of control, hoping its friends back on Earth will find it. Although that could just be us (definitely us).